Many of us grew up in families that used SPAM from time to time sliced for sandwiches or fried for supper. My mother always kept a can on hand just in case the money ran out before the month did. While it was not one of my favorites, I didn't hate it either. It just was there when we needed it. This year the snack was released in limited markets to see how well it would do. While the reviews I have found online have been mixed, but they must be doing well enough since they are still featured on the SPAM website. They come in a 1.4 ounce single-serving pack and come in three different flavors -- classic, teriyaki, and bacon. They do look rather eerily like a dog treat, but so many dog treats are made to look like people food these days that I don't suppose it really matters. Even though SPAM is made of pork shoulder and ham and not scarier bits of the pig, this may just well be where the term "mystery meat" started. These little snacks may only add to the mystery. Certainly there have been many ideas on what SPAM actually means. While the name is supposedly known only to a handful of Hormel executives, some of the guesses have included "shoulder of pork and ham," "spiced ham," and "specially processed American meat." SPAM also has taken a great deal of ribbing over the years. One of the most notable jests was a sketch by Monty Python (see below) in which you couldn't order breakfast without SPAM in it. When I was working for a newspaper years ago one of our columnists held a SPAM haiku contest to see who could come up with the best haiku about it. Sadly, I didn't save any of them or I would share them here. I would think that these tasty little tidbits would be especially popular in Hawaii, where SPAM has reached an almost revered status. Perhaps that is because it is a way to have pork without digging a pit in the ground and holding an entire luau to get some. It is hard to say whether people in general will like them. After viewing numerous YouTube videos on the subject it seems that the jury is still out. Some like them, some hate them, some like one flavor but not another . . . So, it's up to you America! 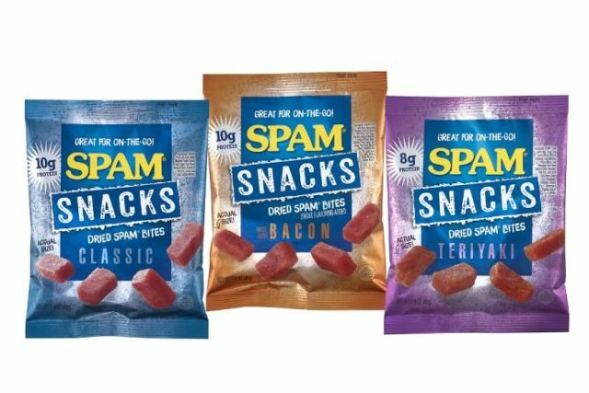 Will SPAM make a move on the beef jerky and Slim Jim markets?